From the VEDAFEU C fire-stop rope system to the VEDAFEU M fire-stop mattress, VEDAFEU N fire-stop blanket,VEDAFEU FB fire-stop filler-board and VEDAFEU PU fire resistant polyurethane foam VEDAFEU has created an extensive range of fire barrier systems. 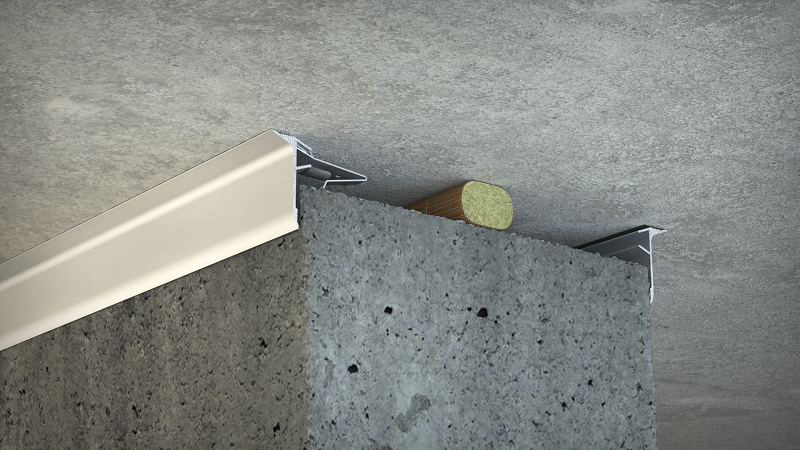 Our products are officially tested and approved for fire-stop joint widths from 10 to 840 mm, and are suitable for use in standard and seismic joint. 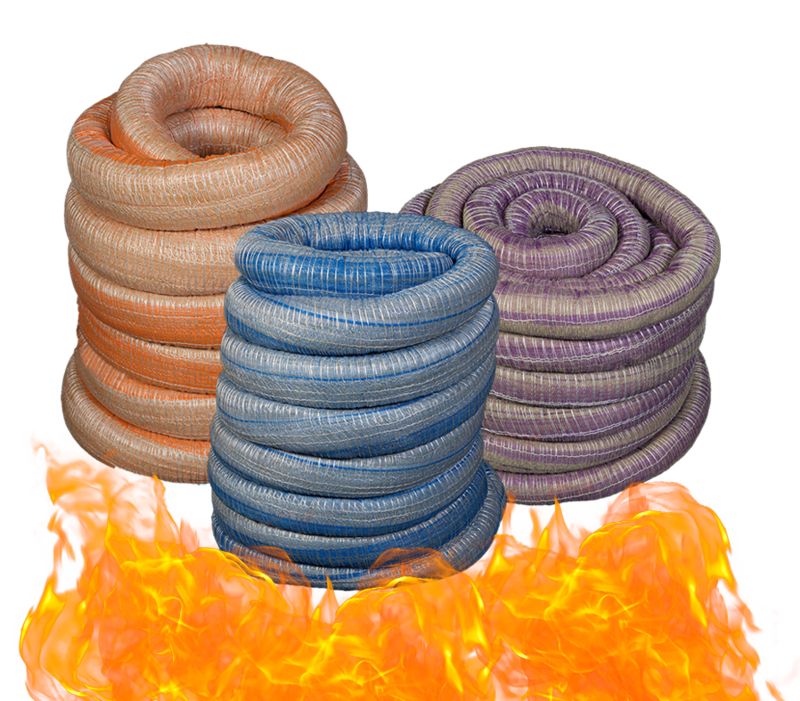 VEDAFEU C rope firestop system consists of a core of fireproof and rot-proof mineral fibers bound by an outer braiding of fiberglass thread. They are resistant to water and humidity, as well as to most aggressive chemicals and micro-organisms. VEDAFEU C rope fire-stop system meets norms for horizontal and vertical joints: tested without sealant and with a movement of +20%, they come in diameters from 12 mm to 180 mm and are EI 240 (fire integrity and thermal insulation of 240 minutes without failure) rated for all joints with gaps from 10 mm to 200 mm. 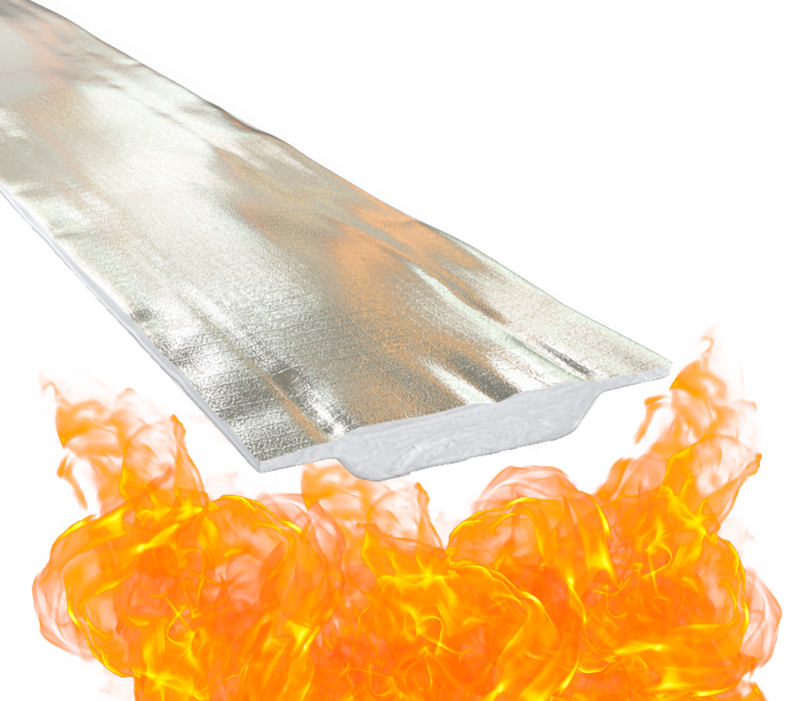 • Fire-stop in horizontal and vertical joints: floor, wall and ceiling joints, joints between prefabricated facade elements, joints between floor edges and prefabricated facades. • For fire partitions, conduit penetrations, services ducts, protection of neoprene supports. • Sealing of joints on masonry edges: fire barrier between floors and curtain walls (see Application Examples). For the installation of cords, refer to the Installation Instructions no. 1 and no. 2 that are validated by the relevant classification certifications. Suitable for any type of building: hospitals, office, industrial and residential buildings, hotels, shopping centers, car parks, schools, colleges, stations, airports, stadiums, etc. 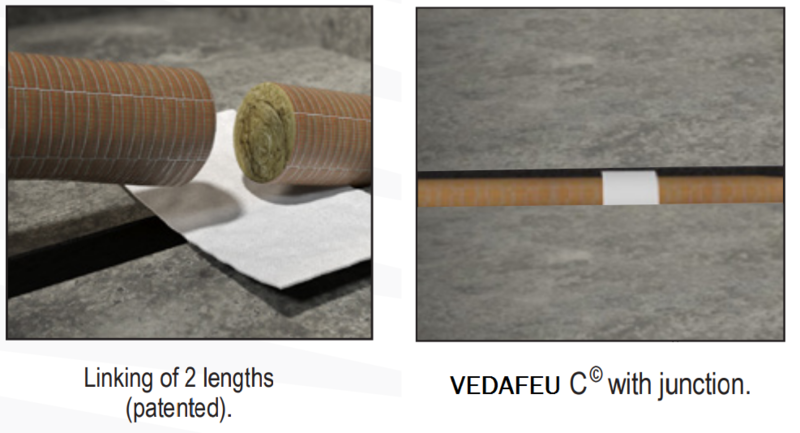 VEDAFEU C ropes are suitably marked so that they can be easily identified and an inspection after installation can confirm that the correct product has been used. Waterproofing & protection: Some floor, wall and ceiling expansion joints might require additional protection. 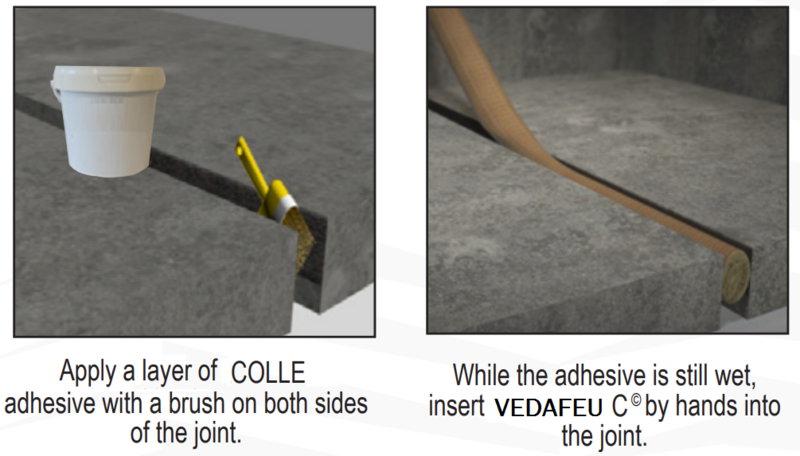 For a waterproof joint, the upper section of the joint must be filled with an Elastoplast sealant (see data sheet flexsil), or a waterproof membrane must be applied to the joint (see data sheet EPDM-S Membrane). A joint cover, a flexible section or a mechanical joint can also close the expansion joint. VEDAFEU C fire-stop systems consist of a core of fireproof and rot-proof mineral fibers bound by an outer braiding of fiberglass thread. Their specific weight varies with the diameter to ensure their flexibility and ease of compression. The load-bearing capacity is always indicated for a joint in its initial position. In case of opening movements, the load-bearing capacity significantly reduces and the product will thus be only adapted for a light pedestrian traffic. The indicated load-bearing capacities are based on pneumatic wheels vehicles with a contact surface of 200×200 mm. For initial joint widths from 100 to 420 mm, with or without joint cover. Officially rated EI 120 minutes without failure. 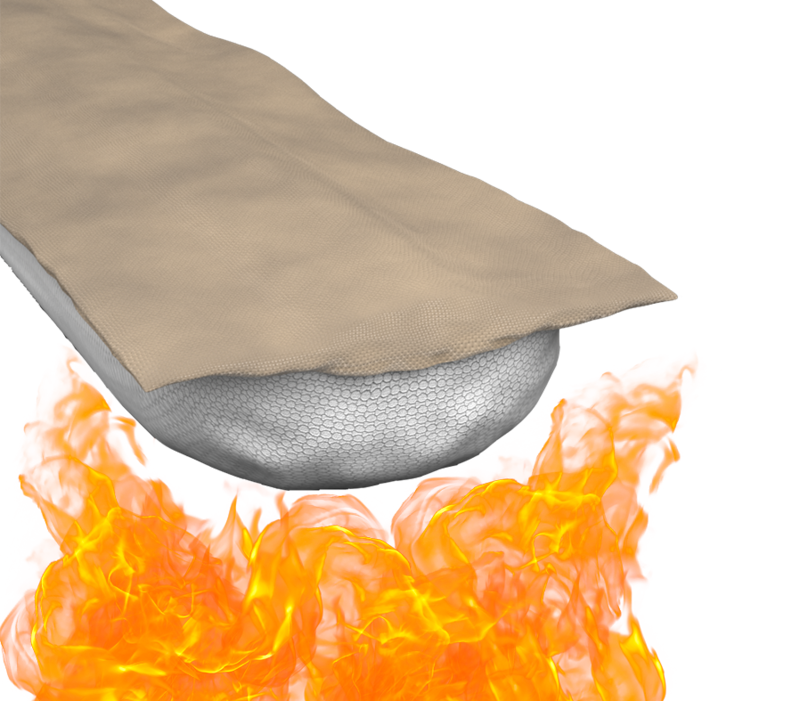 Fire-stop mattresses VEDAFEU M© boast a 2-hour fire rating and accept seismic movements. They are suited to joint gaps up to 450 mm. The fire-stop mattresses are easy to use and quick to set up. Tests were performed with a + 40 % movement. VEDAFEU M © composition and installation method are fully patented. Not hazardous for human health : VEDAFEU M © mattresses are made of bio-soluble fibers and do not contain any asbestos nor classified refractory ceramic fibers..
Our VEDAFEU N fire stop joint range, including fire stop joint covers and fire blankets, conforms to several certifications in respect of horizontal and vertical joints. These fire stop joint covers are specially designed to ensure the fire integrity and gas-tightness of expansion joints with large gaps and/or large movements. Tested with movements of +50%, all our VEDAFEU N fire blankets have an EI classification for fire integrity and gas-tightness, in compliance with current European and French standards, including EN 13501-2 and EN 1366-4 norms. VEDAFEU N fire stop joint covers are available in several sizes to suit joint gaps from 100 mm to 840 mm. VEDAFEU N fire stop joint covers can be used for horizontal and vertical joints requiring fire stop joint protection, e.g. 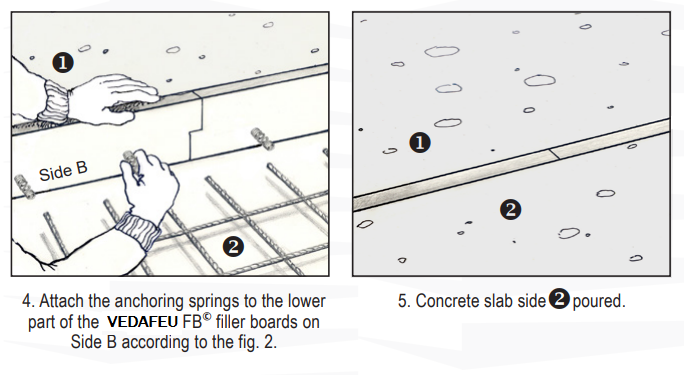 floor, wall and ceiling joints, joints between prefabricated facade elements, and seismic joints. They are also suitable for fire partitions, conduit penetrations, services ducts, protection of neoprene supports, and for joints on plate edges. 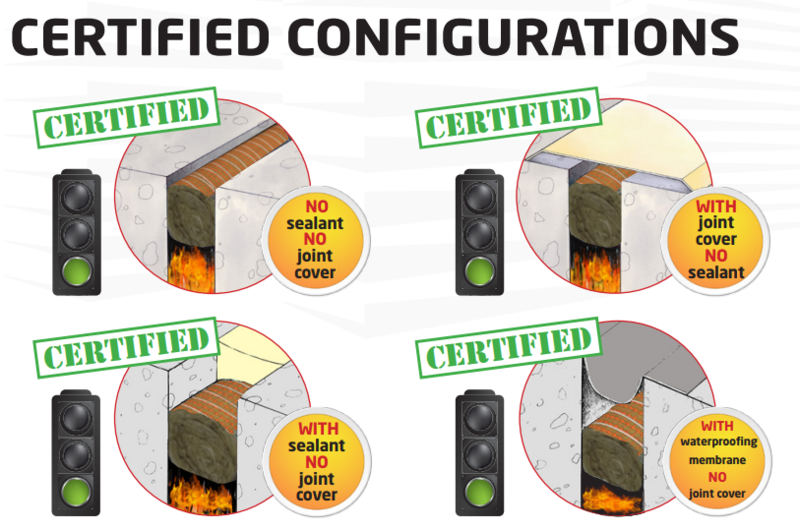 VEDAFEU N fire stop joint covers must be installed in accordance with the approved instructions for the relevant classification certifications. VEDAFEU N systems provide effective protection for buildings that house works of art, as well as for hospitals, offices, industrial and residential buildings, hotels, shopping centers, car parks, schools, colleges, stations, airports, stadiums, and more. Our standard range is suitable for joints with initial gaps from 100 mm to 560 mm. Other widths are available on request. The composition of VEDAFEU C N fire stop blankets and their method of installation are patented. Handling is easy and safe: VEDAFEU C N fire stop blankets do not contain any asbestos (which is a banned substance) or refractory ceramic fibers which are dangerous to health. This is because they are manufactured with long mineral fibers that exceed 6 microns in diameter and which cannot enter the respiratory tract, and are thus classified as not dangerous to health by the International Agency for Research on Cancer (IARC). INSTALLATION: EXPOSED AND NON EXPOSED SIDE TO FIRE. 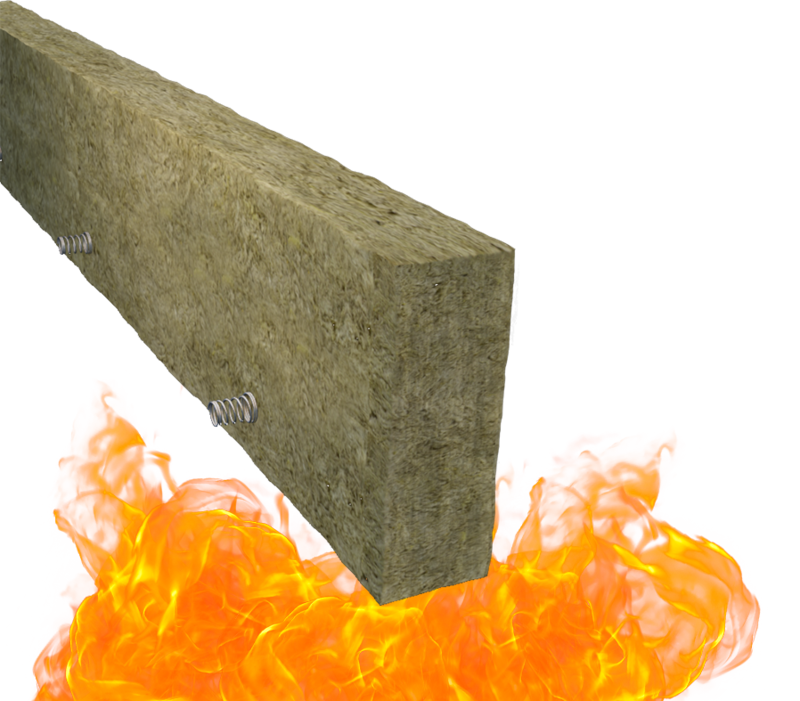 2-IN-1 PRODUCT, it materializes the expansion joint while pouring the concrete and is 4-hour fire rated. 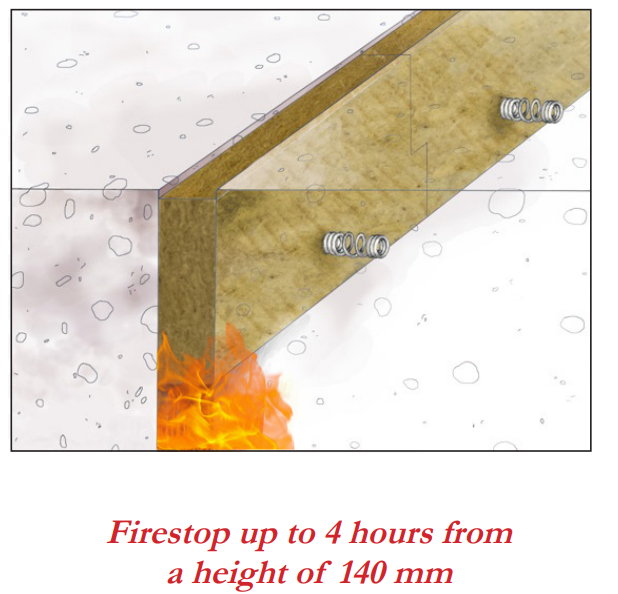 Fire-stop filler boards VEDAFEU FB© boast a 4-hour fire rating and are suited to joint gaps up to 100 mm. Genuine all-in-one products, they perform a form-work function, as well as offering fire-stop and heat/acoustic insulation properties. easy to handle and to install. It is a substitute to materials (honeycomb cardboard, polystyrene …) used to realize the expansion joint while pouring the concrete.